Theeran Adhikaram Ondru is a riveting film, says A Ganesh Nadar. It's like watching two movies at the same time. 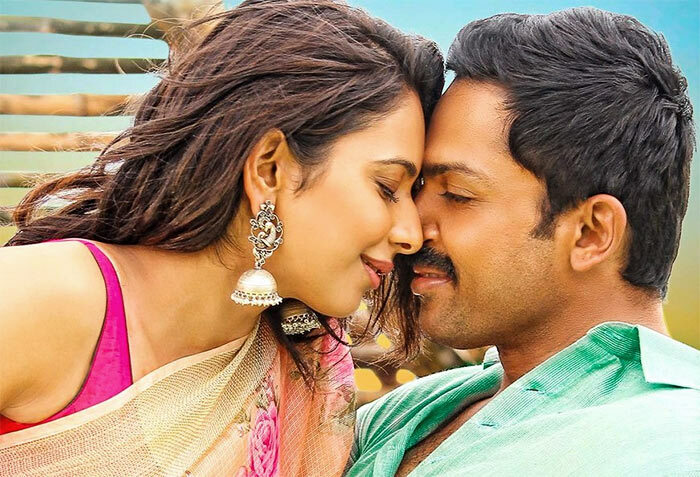 In one, we have Karthi romancing Rakul Preet, which ends in a happy marriage. In the other, we have menacing villain Abhimanyu Singh, who looks like he will be the new baddie on the block. The film is based on a true story, which happened at the turn of the millennium in Tamil Nadu. A police officer on the trail of a gang of criminals realises that this gang has existed through centuries. Known as 'thugs' during the British Raj, they continued with their profession through generations. It's an edge-of-the-seat thriller, where you don't know where the next dead body will drop. Killings are shown in total brutality. In one scene, a women is choked in a fish tank and then shot. Very gory. As it was the first day first show outside the theatre, fans performed a 'milk abhishekham' of the hero's banner (here's how they do it!) and showered it with flowers. Inside, the audiences cheered the hero through every victory and laughed at all his jokes. The story travels through the entire country and the clues are few and hard to find. Then, the gangster makes two mistakes: he kills a ruling party MLA and then, he kills a cop's family. Suddenly, our hero's team has a lot of money and permissions. North Indian cops are shown to be scared of the baddies. To add to that, there is an entire village supporting the villain against the hero. It was a question of supporting the sons of the soil against these Madrasis. Yes! The word 'Madrasi' makes an appearance in our cinema after a long time. There are chase sequences in jeeps, buses, trains and horseback. The movie is beautifully filmed in Rajasthan. Palaces and the beauty of the desert are well brought out. At the same time, the harshness of the terrain is also well portrayed. The romantic portions are filmed in broad daylight while the violent parts are shot mostly at night. There is even a Hindi song in the movie, with no translations or sub-titles. It's a straight Hindi song! The song entertains the villains in their den and dutifully, they throw away the new Rs 2,000 notes, showing clearly that this scene was shot post-demonetisation. The other songs play in the background; the actors don't actually sing them. A judge reminds us of Saurabh Shukla in the Jolly LLB movies; he makes a brief but funny appearance. Theeran Adhikaram Ondru is a riveting film, and the audiences seemed to enjoy it.